During my adventures in LA I found myself at a tech mixer in Santa Monica. Amid some of the projects and startups on display, a VR game rose above the crowd. With a iconic neon 80’s motif and sensational synth music to boot, creative director and graphic designer Abraham Aguero had a winning combo. The game adds unique mechanics to the music rhythm game genre that I have not seen yet. I am very excited to have had the opportunity to talk with Aguero about his process and his motivation for creating this game. I was struck by how this particular project was a perfect marriage of all of his passions. Can you talk about your journey to game development? Actually it was quite interesting, I had already made two small virtual reality games, MAX VR and Magnatron, before starting Synth Riders. Both of those games were for Android and iOS. Like any new venture we had some good and bad moments during the development of Synth Riders. From the beginning we had clear idea of the game mechanics that we wanted to implement as well as the aesthetics. Then we added more layers of interactions as the game evolved. One interesting part of the game is the selection menu and the environment around it. When I started designing the room, which is where you arrive after the intro screen, I wanted to create something that felt comfortable and at the same time create a space where you could reside there for hours taking in all the different things that are in the room. The same attention to detail was given to the exterior, where you can see cars flying around. We’ve had many comments from players saying they want to have a room like that or, they would love to live in this place. For me, this room is like a place where you want to lose yourself for a while before returning to reality. In regards to the gameplay, I took so many references from our community @retrowavevr on Instagram combined with other references of films from the 80’s. There are two scenarios in Synth Riders that were inspired from movies that I liked. One scenario is “through the Sphinxes Gate” which is a reference to the Sphinxes in the movie “Neverending Story “, the second reference is from the second season of “Stranger Things” which is a giant spider that has a TV for a head which you can see in the “Glitch” stage. There are other references that I have used, but these are two of my favorites. What inspired you to tackle a virtual reality project? Three years ago I tried Google cardboard, and I was really blown away. VR really changed my perspective of what people can do with technology. I had been been used to a flat screen for so long time. Having the opportunity to build something on a 360 canvas was enough inspiration for me to jump in and explore this new world of VR. 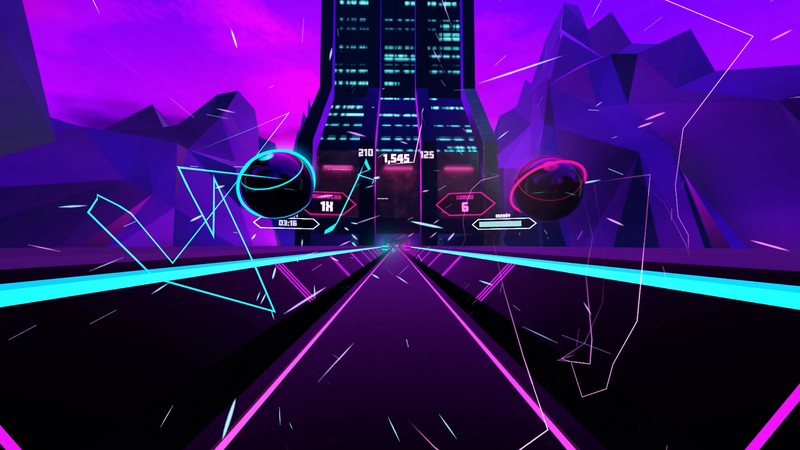 In regards to the actual game and the game mechanics of Synth Riders, I’d been playing a lot of Guitar Hero, Thumper and Osu. Thumper was my main inspiration. I liked the sensation of speed, the abstract graphics and the color palette. It is pretty much like the chrome style that you can see in the logos from the 80s. 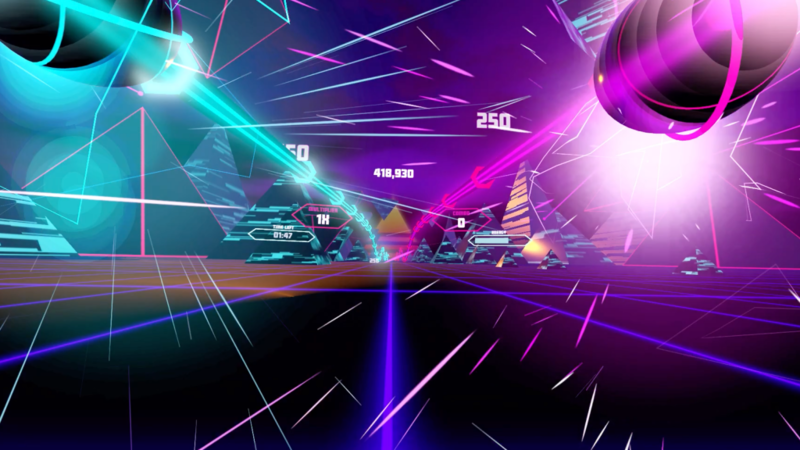 We wanted to do something not as fast as Thumper, but at least have some speed involved. That is why, in Synth Riders, the foreground appears to be moving forward. You feel like the notes are coming at you. We started simply. The first version we launched you could hit any note with any hand. We had some simple combos, with one hand and two hands. We felt that the game was challenging, but not challenging enough. So we decided to split the hands into two different colors: blue and pink. Can you talk about Synth Rider’s cool 80’s wave aesthetic? What brought to this design choice? Around 3 years ago, after I discovered VR, I was also into synthwave music which was the two drivers for me to start making something. I then started a community on Instagram called RetroWave VR. which is a community where I featured artists and artworks involved with Retrowave, Cyberpunk, Sci-fi and Vaporwave aesthetics. 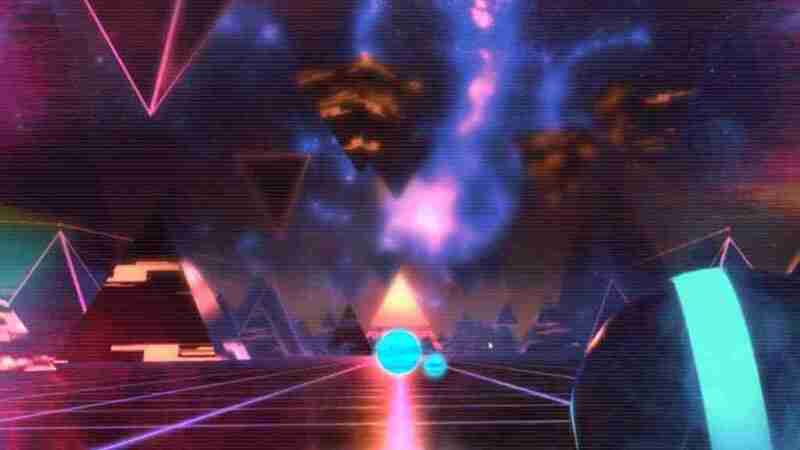 This idea pushed me in a direction where Retrowave VR might have a potential to create 80’s retrowave experiences using emerging technologies such as VR and AR. I wanted to create experiences that were inspired by games like Space Invaders, Defender or Pong. Because I was attracted to the aesthetics from the 80s, some of the things that are very relevant to me in regards to the aesthetic is the use of chrome and neon hues. 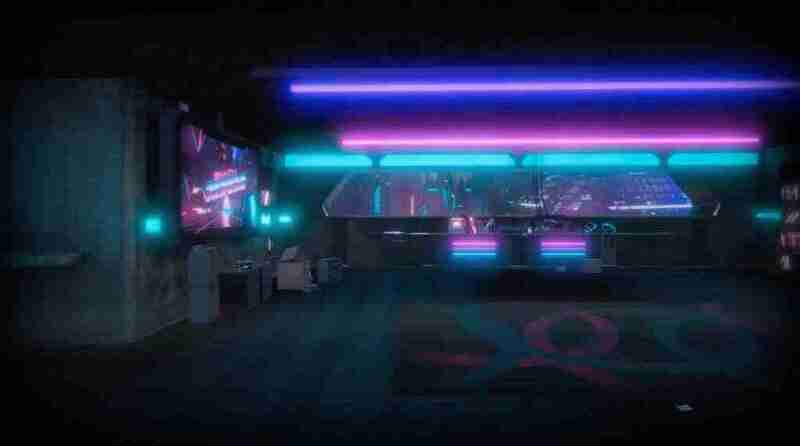 I also liked the retrowave and cyberpunk sensibility that evolved at that time which you can see in movies like Blade Runner and Tron. I have now built up a following of about 31,000+ fans from all over the world which proves I am not the only one who is into this scene. I want to thank Abraham for taking the time to talk to me and sharing his story with Sugar Gamers. If you would like to learn more about synth riders you can check out the OFFICIAL SITE.